A new group is formed called Kaxophonic. 4 saxophones and 5 percussions. http://kaxophonic.se/. Gigs with SHG, Hellskotta and Kaxophonic. Release of Hellskotta´s second album"Kuling" in april. Recieved many good reviews. Gigs with Hellskotta and SHG during the year. Sofi continues working with her own band, Hellskotta and a recording with, Tjo vad det viftar. Also some consert with Peps Persson. August 2016 Hellskotta records a second album. Out april 2017.Watch out! Recording autumn 2012 with the Gang. Obi C Agor, singer from Nigeria/England is invited for 2 songs. Salieu Dibba, sings a beautiful song for peace in the song Mali. Release consert 27 march for the new cd, "Sun & Rain" at Inkonst, Malmö! 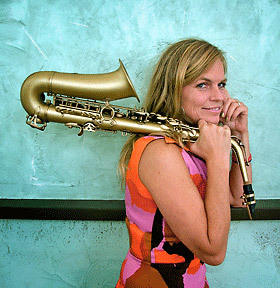 Continuing touring with her band in different places like Marocco, Tanjazz festival, Pori Jazzfestival (Finland)etc. Autumn 2009 she produce music for relaxation. A cd called "Ethnic atmosphere for relaxing moments". All instruments are played by Sofi. In march 2008 she releases her 6 th album "Drumming is calling" still with the afrogroove feeling and the same Gang of musicians. Touring and working with different projects as well as teaching music. She records a new cd and invite this time Tony Allen, drummer and the master of afrobeat (Fela Kuti) on four songs. She also collaborates with the Swedish rapper Timbuktu for an interesting meeting in the afrosound on a swedish song. Still in her own stile of afrosound she records with the rest of the Gang this cd called "To Give is to Get". Mixed by Jens Lodén it has a more modern sound to it. With lots of new inspiration she puts out her fourth cd "Go Open", with some musicians from the Paris gang and two new swedish musicians. A live recording in Sweden and a mature and groovy cd, still in her own style. This time with a more instrumental touch. The words "Go Open" comes from pidgin english "One way go close another one go open". Sofi puts out her third cd "Time will tell". The music is still her own mixture of afro, funk and jazz but adds in some drum´n´bass influence. She still plays the alto and soprano saxophone as her main instruments, but she also sings, plays the Thumb piano, composes and produces. With Smadj they put out their cd "Equilibriste" on the label Melt. She released with Smadj a vinyl called "Bon Voyage" on the english label Freerange. She moved her whole band to Sweden where she recorded and produced her second album "Hey Now" on the label Gazell Music. Apart from her own group, Sofi has also started two other projects; Klaxon Five, a lively brass band and Smadj & So, a drum´n´bass outfit with Rai and jazzy influences. In -93,Sofi realesed her first album "Travel & See" and started touring with her own group Sofi Hellborg Gang. Her music is a reflection of the journey Sofi has travelled and is a mixture of African, jazz and funk music. She played with the french star Charlelie Couture and recorded on the live album "Souvenir Live". Sofi left Jazira and moved to Paris, where she joined Guinean singer and Kora player Mory Kante, toured all over the world and played on the two albums "10 Kola Nuts" and "Akwaba Beach" which included the international hit "Ye Ke Ye Ke". From early on, Sofi was always drawn towards African music and decides with a friend to travel to Cameroon. Five months of playing with both modern and traditional musicians. Sofi started playing music seriously at the age of seventeen in the music jazzschool in south of Sweden with the saxophone as her main instrument.